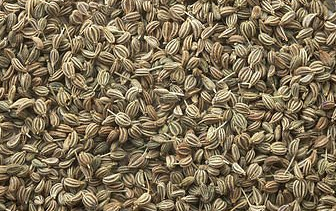 India 9 October 2016: Carom Herb popularly known as Ajwain in hindi in India is one of the common herbs used in Indian cuisine. 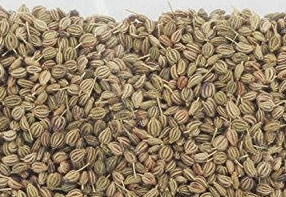 Carom seeds are also known as Bishop’s weed, Thymol seeds, ‘Vamu‘ in Telugu, ‘Omam‘ in Tamil, ‘Ayamodakam‘ in Malayalam, ‘Om Kalugalu‘ in Kannada, ‘Ajmo‘ in Gujarati and ‘Ova‘ in Marathi. The scientific name for carom herb is Trachyspermum Ammi. This herb has a very strong aroma; For the same reason this herb is called Ugragandha in Sanskrit. Ajwain is known to have various health and medicinal benefits. 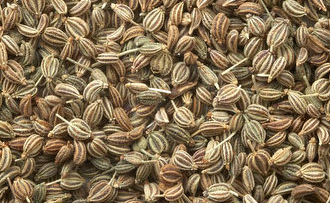 Ajwain seeds are most commonly used as a home remedy for Instant relief from stomachache. It is also very effective to kill worms in the intestines. Ajwain is also known to be beneficial for toothache, Earache, Influenza, Arthritis, Heart problems, Nasal blockage. The mild alcoholic qualities present in ajwain make it an amazing home remedy for instant stomach pain relief. Having a mixture of Ajwain seeds with a little salt mixed in warm water, sipping on this water is very beneficial for getting relief from indigestion and stomach pain. If you are suffering from chronic and recurring cold, having 2 grams of fried ajwain seeds for a course of 15-20 days is sure to give you relief. Ajwain seeds have a strong aroma and Inhaling of its grind seeds is effective in treating headache, migraine, cold and cough. 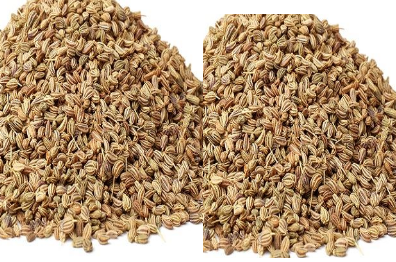 Chewing Ajwain seeds along with lukewarm water works amazingly to treat Cough. Inhaling the smoke of roasted Ajwain seeds works as bronchodialator and helps to make the breathing pattern easier. The person suffering from Asthma may take the Having a teaspoon of the paste of Ajwain mixed with Jaggery twice a day is helpful in treating asthma. Having a mixture made from mixing 1 teaspoon of Ajwain seeds with 4 teaspoons of Bay leaf juice twice a day is very effective in treating polyuria which is commonly seen in people having Diabetes. Having a 30 ml dose of decoction of ajwain at night for 2 months can help in getting rid of Alcohol addiction. People who consume a lot of alcohol, may experience acute stomach pain when they take this ajwain decoction. In such situation having a teaspoon of ajwain seeds with warm water twice a day will help reduce the pain. Ajwain is known for its ability to reduce the impact of threadworms and intestinal bacterial infection which is common in cholera patients. This ability of ajwain makes it an amazing choice to give cholera patients for a speedy recovery. If you suffer from Kidney stones, having a mixture of Ajwain seeds with honey and vinegar for Ten days will help to dissolve kidney stones and ultimately dispose them with urine. Ajwain is known to have appetite increasing properties and also the laxative components present in it helps to fasten the bowel movement which helps in losing weight fast. 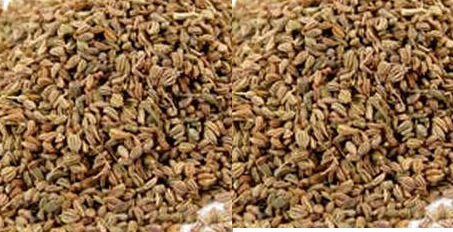 Having ajwain on a daily basis helps to regulate obesity. For ages Ajwain is used as a herbal remedy to treat gas, flatulence and indigestion. Having Ajwain Distilled water helps to get instant relief from the above problems and also improves appetite. 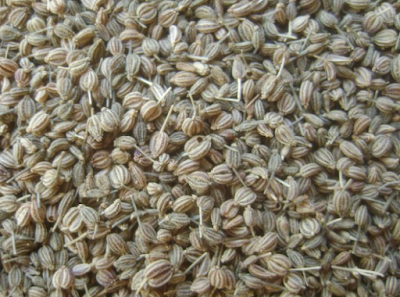 Ajwain seeds are said to have anti-hyperacidity properties. If you suffer from acidity or hyperacidity, then consuming ajwain with lukewarm water and salt in the morning or after meal is sure to give you relief. Having this mixture for 10-15 days it provides a long term relief from acidity and hyperacidity. 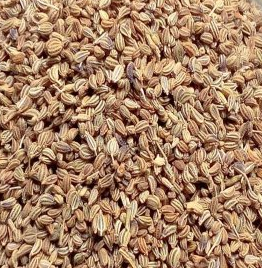 Ajwain is the important ingredient in Indian kitchen. Ajwain is also known for its medicinal qualities. 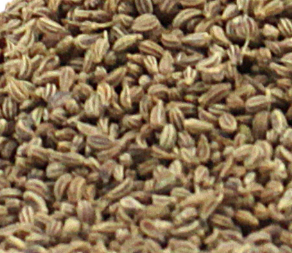 Ajwain or Carom seeds are loaded with nutrients and minerals. It contains fats, proteins, fibre, sugar, minerals, calories, etc. 100 gram of Ajwain or carom seeds contain the following nutrients: 305 Calories, 25 grams fat, 4 grams Saturated Fat, 15 grams Polyunsaturated Fat, 5 grams Monosaturated Fat, 10 grams Sodium, 43 grams Carbs, 39 grams Fibre and 16 grams Protein. It also contains calcium, thiamine, riboflavin, phosphorus, iron and niacin. Carom oil is obtained from its seeds that contain 2.5% to 5% of essential oil. Their leaves and flowers are also used to extract oil that contains 35-60% of thymol. This oil is either colourless or pale brown in colour. Carom oil is widely used as germicide and fungicide.